It looks like you are using Internet Explorer. Unfortunately, important features on our website will not work in Internet Explorer because many modern website features are not supported by Internet Explorer. You may read more about it here. John Kelly Photos is a quality provider of Event, Sport and Race photography. Your event partnered with John Kelly Photos to provide you free event photos. Your free images are provided by The Abominable Snow Race. Be sure to thank your sponsor by liking them on Facebook. Enjoy getting free photos? Like John Kelly Photos on Facebook to get notified whenever event photos are posted. 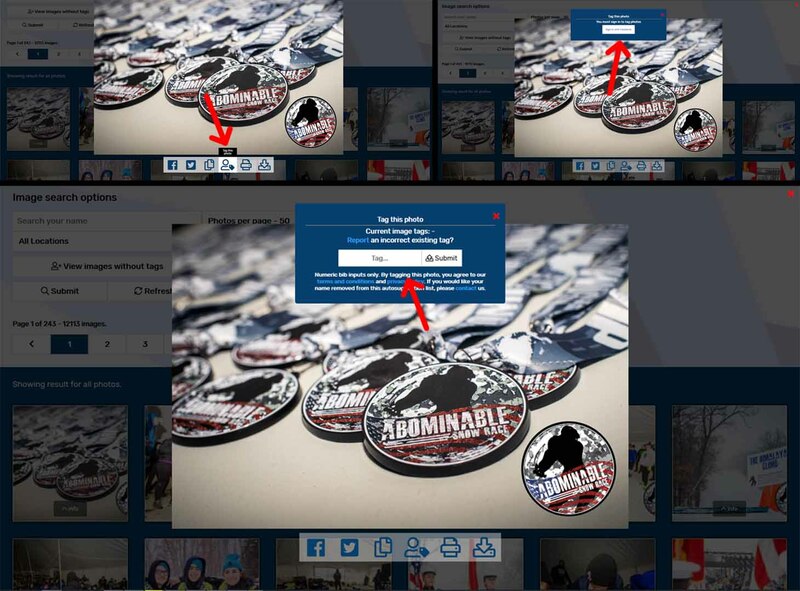 Because the race bibs did not arrive in time for the Abominable Snow Race, our photographers were unable to tag your images by your bib number. To help you find your images easier, we have added a feature to allow you to tag yourself, your friends, and anyone you recognize in the images. We ask you to please help us out in getting everyone their photos by adding these tags to the images by simply clicking the ‘tag’ button on the bottom row of buttons displayed on each image and typing the person’s name into the tag box. This will allow you to search for images you have been tagged in by simply typing your name into the search box. Because tags will be added throughout the week, if you don’t have any results for your name, be sure to check back frequently to see if anyone has added tags to photos of you. If you wish your name to not be shown in this application, please contact us and we will remove your name along with any tags of you at your request. Page 1 of 243 - 12113 images. Showing result for all photos. Report an incorrect existing tag? Reporting incorrect tags helps us remove tags that may have been added incorrectly. We cannot guaruntee to remove all reported incorrect tags, but we will try to regularly check on incorrect image tags and remove them when appropriate. We try to make finding your images and using our application as easy as possible, but if you are having trouble, we have highlighted a few more common problems and their solutions below. See if your question is directly addressed here. If not, feel free to contact us and we would be happy to help! No results for your bib number? If you are having trouble finding your photos, don't worry, there may still be great photos of you! First, try narrowing your results by using our various search filters. Narrowing your selection by the rough time and location you think a photographer might have captured your photo, or when you were at a specific location will help reduce the results. You can reduce your results further by selecting the 'View images without tags' button to only show images we were unable to tag. How can I tag other people? If you want to help out us as well as your fellow racers, you can help tag images we were unable to tag. If you recognize someone in the photo, you may add their bib number to the image to add the image to results for their bib number. To add a tag, simply click the image thumbnail to enlarge the photo. When the photo enlarges, select the 'add tag' button and follow the prompt. You will have to sign in to tag images. What if saw a photographer take my photo, but I can't find that image? Was the photographer a John Kelly Photos' photographer from our team? Our photographers have lanyards with their credentials on them. The lanyards are blue and have our logo on them. If the photographer did not have this lanyard, then they were not from our team. The photographer may have taken your image, but if their was an obstruction such as someone blocking the image, the image may have been removed. The image may have been part of our promotional album. At many events we designate one photographer to go around and take marketing or promotional type photographers. These images may or may not be posted with the rest of the images availible here. These images are often eventually posted to our Facebook page or the clients Facebook page. What if I still can't find photos of myself? If you tried searching very hard but still cannot find photos of yourself, shoot us a message and we would be happy to help you out. We will do our best to help you locate your photos! Please understand that while we try very hard to capture images of everyone, it is not always possible to get 100% of participants their images. We are very sorry if we couldn't capture your image this event and hope we can get a great photo of you next event! If you still need help or assistance, feel free to shoot us an email and someone will respond to your question as soon as possible.